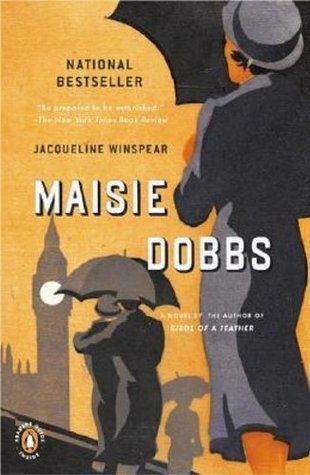 I just finished Maisie Dobbs by Jacqueline Winspear. This is one of those books I grabbed when browsing at the library on the off chance that it was any good. In high school, I read a good number of detective novels by Agatha Christie and Dorothy Sayers, but I haven’t read many good ones since. I get bored with the private detective routine: a solitary and brilliant but quirky person devotes his or her life to figuring out what no one else can, and always succeeds, but also always comes into grave danger and escapes by the skin of his/her teeth. There are some detective novels, though, that manage to rise above the ordinary and become something more. One such books is the first book in the Flavia de Luce series by Alan Bradley, The Sweetness at the Bottom of the Pie. The characters in that book are so original. But in general, I am not a fan of the detective novel. Maisie Dobbs was more than a detective novel, though. Here’s the summary from goodreads.com. The structure of the novel is interesting because it begins with Maisie opening her own detective office and stumbling on some intriguing facts and coincidences, then jumps backwards to Maisie’s history of how she went from household servant to private investigator, and then goes back to where the story began to follow the original case as it unfolds. Maisie Dobbs is a fun, not-too-gruesome, detective novel that also manages to make the history of the first World War become more real. It’s not a pretty history. I learned something about how much it changed those who participated in it. Maisie’s character is a little cut and dry, but it is a good starting point for a series. She is a very ladylike character, which I appreciate. I don’t know that I’ll read any of the other books in the series (10 books in all), but I’d recommend the first one if you like detective novels or historical fiction. This book is an even mix of both. I’m glad to hear the characters and settings are good throughout the series. I’m more likely to read more of the books in this series now. Thanks for the comment!